I have visited many blog sites and most of them have "Related Posts" or "You may also like - " section for visitors who like to discover more related articles or stories. I am one of those visitors who likes to find out more interesting posts which are related to the original article I have read. Indeed, having related posts section will increase your exposures of your site. That is no doubt about it. Unfortunately, I didn't have this feature on my site since I started to customise it. Of course I then started to do some research about building a "Related Posts" widget for Blogger. Obviously, there are lots of articles talking about "adding" related posts widget to your Blogger site but not many of them have detailed explanations. 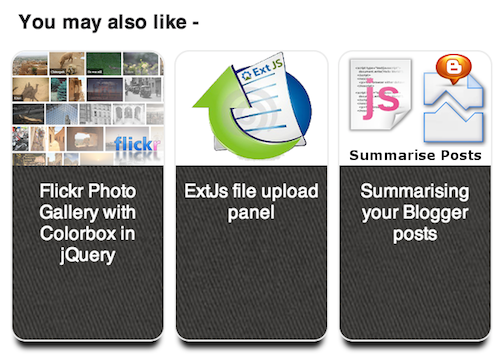 Well, fortunately some of them guided me to create this jQuery plugin. So first of all, what does related posts mean? Are they related to the title of the original article? Or are they related to the category of the original post? Or are they related to the author's posts? Well, I would answer yes to all of them. You may have other supportive answers too. In this plugin, I find related posts based on the current article's "labels" via the Blogger's RSS feed. So you need to label your article in order to make this plugin work. Since the RSS feed provides all information I needed, I just need to extract and parse the data to what I need for "related posts". So what do I need from the RSS feed? Luckily Google provides a comprehensive documentation for its data APIs for Blogger developers so if you want to dig more information out, just pay a visit to here. Anyway, the concept is to use the labels of current article to find related posts and the post id or article link as identifier to exclude current article from the collection of related posts. When the labels are retrieved, then we start to find and collect posts whose labels contain the original article's labels. Finally, we output these collected posts to the site. Here is the source code of this plugin. You may notice that I use the url /feeds/posts/default instead of /feeds/posts/summary. If I use summary, then I cannot extract the original images for thumbnails. Also if the images of the article were not uploaded via Blogger then you don't have the thumbnail link from the feed. Therefore the most secure way is use the original image link from the article itself. So how can I use this widget? when you see it, place the sample code above it. Now, you should be able to see your related post on your page. You can tweak the query to search articles related to the author or give it a date range. If you don't know how to do it, just leave a comment and I will help you. If you have other suggestions or ideas, please also leave your comment. Thanks, Raj. I am glad that it could be useful for you as well. Thank you so much for this post! I've tweaked your codes and am now using this on my blog theundercoverprincess.com! :) Thank youuu! You are very welcome, Eva. I'm glad that the code can be used on your site and you have a very nice blog. Hi i get an error while i try to execute step 3. This is the error message"Error parsing XML, line 2117, column 2: The content of elements must consist of well-formed character data or markup"
I believe it was a typo at the step 3. I apologise for that. Please add an exclamation mark (!) after first < symbol. "<-- comment out below if you ... -->"
Is your RSS feed enabled?